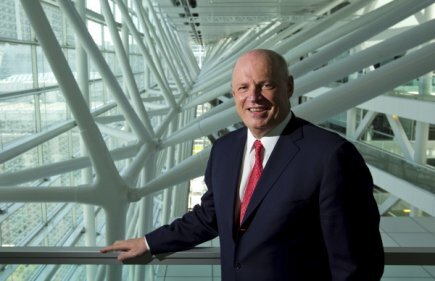 The top real estate executive of Canada's second-largest pension fund said he won't have to make riskier investments to achieve his target of a 7 percent to 8 percent average annual return for the next decade. Daniel Fournier, chief executive of Ivanhoe Cambridge, the real estate arm of Caisse de depot et placement du Quebec, said on Monday he won't have to take bigger risks as yields weaken, a strategy he saw many investors take before the global financial crash. "I don't think the answer is to go way up the risk curve," he told reporters in Montreal. Ivanhoe Cambridge, which owns C$48 billion ($36.22 billion) in assets, generated an average 13 percent return a year over the last five years, a target that is no longer "sustainable" as markets cool, Fournier said. He said Ivanhoe Cambridge would continue to use the same strategy of striking a balance between higher yielding, opportunistic transactions and the purchase of quality properties that deliver stable but comparatively lower returns. "It's the balance between the two that gave us the 13 percent over the last five years and where we're trying to produce the 7 or 8 percent that the Caisse is expecting from us," he said. In January 2015, Ivanhoe Cambridge generated headlines for buying 3 Bryant Park in New York for $2.2 billion, a near-record price for an individual U.S. office building. While commercial real estate prices have soared in global gateway cities like New York and London, Fournier said that unlike 2007 and 2008, he doesn't see any froth, or trend of overbuilding in U.S. markets that was prevalent in the run-up to the global crash. For those of you who don't know him, Daniel Fournier is one of the most powerful under the radar real estate investors in the world. He heads a very experienced team at Ivanhoe Cambridge and doesn't get the recognition he truly deserves (he's a shoo-in to succeed Michael Sabia if he wants the top job at the Caisse in the future). Fournier might not get paid the big bucks a few of his counterparts are collecting but he's running one of the best real estate outfits in the world and definitely the best in Canada. In fact, when it comes to real estate, the Caisse's subsidiary has few competitors in the world. And when it comes to real estate benchmarks, there too the Caisse is leading its large counterparts in Canada. How do I know? I took the time to read the Caisse's 2014 Annual Report which was released in late April. It's packed with excellent information on the performance, benchmarks and a lot of other insights pertaining to the Caisse's operations. 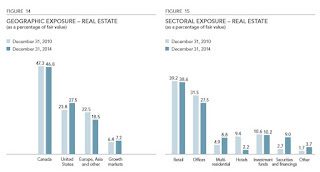 As you can read, the real estate portfolio 10% in 2014, exceeding its long-term target. Moreover, as stated: "all the transactions had the same objective: to sell non-strategic assets so as to focus the portfolio on high-quality assets and to build critical mass in certain sectors and key markets." 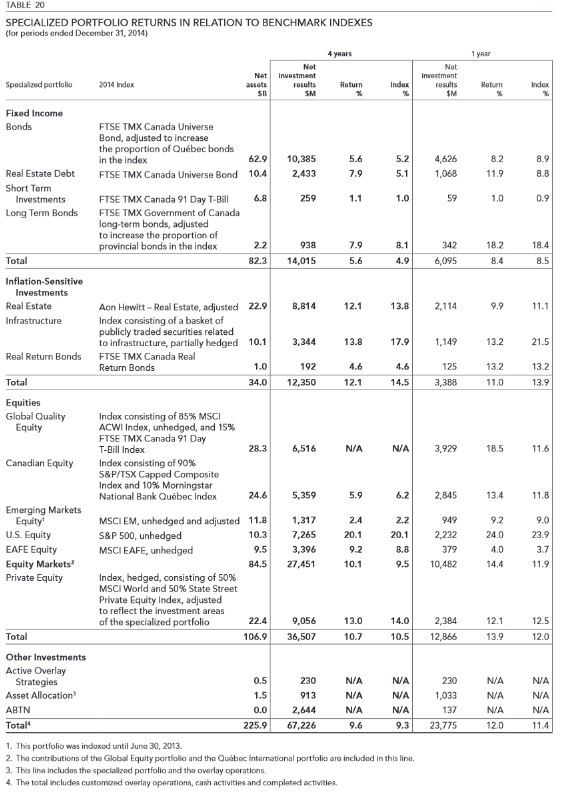 While the Caisse still has significant real estate investments in Canada (47%), it's been growing its U.S. portfolio (so have others in Canada) and reducing its exposure to European real estate. 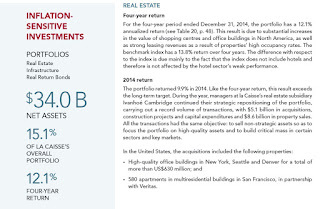 In terms of sectors, the Caisse has been betting big on multi-family real estate over the last few years and shedding its opportunistic hotel assets. 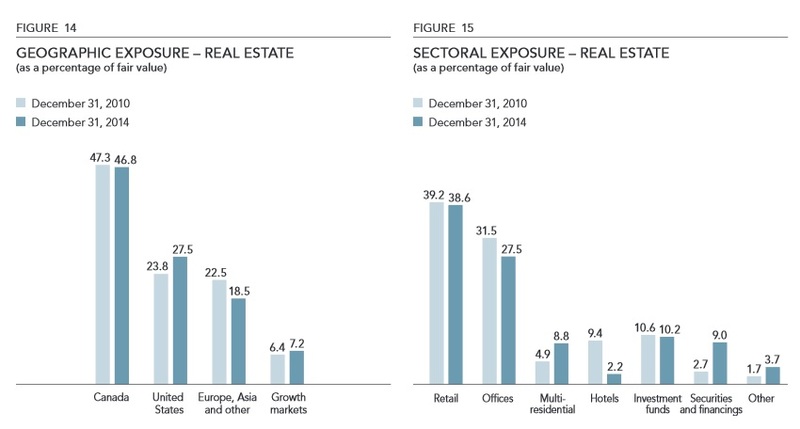 As you can see, the Caisse's real estate portfolio returned 9.9% in 2014, underperfoming its benchmark which returned 11.1%. Over a four-year period, the the Caisse's real estate portfolio returned 12.1% annualized vs a benchmark return of 13.8% annualized. So, if the Caisse's real estate subsidiary is underperforming its benchmark over a one and four year period, why am I praising it? Because when I analyze pension funds and their respective performance, it's all about benchmarks, stupid! I couldn't care less about headline performance figures, I want to know the benchmarks governing the underlying portfolios and what risks pension fund managers took to beat their benchmark and whether those risks are appropriately reflected in the benchmark of each investment portfolio. Similarly, when some hedge fund hot shot was touting their "super high Sharpe ratio," I would rip into them if they were taking stupid risks in derivatives and trying to pull a fast one on me thinking I'm an idiot. When I look at the benchmark governing the Caisse's real estate portfolio (Aon Hewitt Real Estate index, adjusted), I can easily discern that the group at Ivanhoe Cambridge doesn't have a free lunch when it comes to its real estate benchmark. 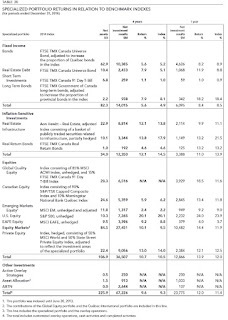 Again, I don't want to beat a dead horse but go back to read my detailed comment on PSP's fiscal 2015 results, especially the part about their Real Estate benchmark, and I'll let you draw your own conclusions on who has it easy and who doesn't when it comes to Canada's pension plutocrats. Canadian pension fund manager Caisse de dépôt et placement du Québec said on Monday it has formed an investment platform with a group of leading Mexican institutional investors to put money into infrastructure opportunities in Mexico. The new vehicle will invest C$2.8 billion ($2.1 billion) over the next five years in energy generation and distribution, along with investments in other areas like transportation and public transit, said the Quebec-based pension fund manager. Caisse said it plans to commit some C$1.43 billion to the fund and retain a 51 percent stake in the investment vehicle. CKD IM will hold the remaining 49 percent. The current shareholders of CKD IM are Mexican pension fund managers XXI Banorte, SURA, Banamex, Pensionissste and Infrastructure fund Fonadin. These pension fund managers together manage some 62 percent of Mexican pension fund assets, said Caisse. "When we look around the world, especially in the infrastructure sector, Mexico stands out as an exceptional country to invest in," said Caisse Chief Executive Michael Sabia in a statement. 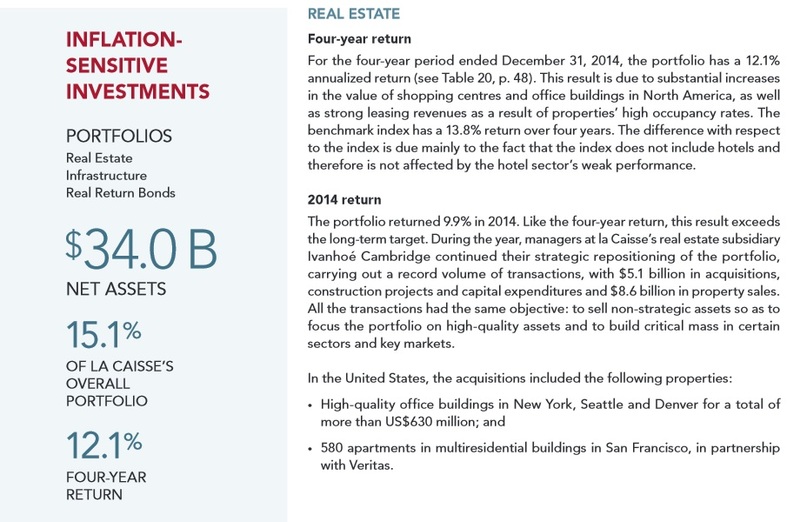 Caisse has been a major infrastructure investor for over 15 years. Its infrastructure portfolio is currently worth more than C$11 billion and includes investments in the Port of Brisbane, Heathrow Airport, Eurostar and Colonial Pipeline in the United States. The pension fund manager has stated that it plans to double the size of this portfolio by 2018. "We believe recent reforms in the energy and infrastructure sectors have opened the possibility of win-win partnerships that will benefit the whole Mexican economy," said Grupo Financiero Banorte CEO Marcos Ramirez Miguel in the joint statement issued by Caisse. As part of the transaction announced Monday, CKD IM is also acquiring 49 percent of Caisse's equity investment in the ICA OVT venture, which currently owns four toll road concessions in Mexico. No doubt about it, Mexico is a big growth market for the Caisse and Michael Sabia has repeatedly gone on record to state this. That country has huge potential but its disorganized crime continues to be a source of major concern. Still, Mexico's new breed of cartel killers isn't dissuading the Caisse from investing there and truth be told, if you read the nonstop coverage of Mexican crime, you'd think the country is a basket case, which it most certainly isn't. Also worth noting the Caisse has beefed up its infrastructure team headed by Macky Tall and hired some outstanding professionals with direct infrastructure investment experience. This will come in handy as it prepares to handle Quebec's infrastructure projects. Below, Martin Feldstein, Harvard economics professor, discusses the risks associated with the Fed's easing policy and why it no longer makes sense. This interview was done in late August, prior to the Fed's big decision, but it's well worth listening to as you consider risks in public and private markets. Hope you enjoyed reading this comment. If anyone has anything to share, feel free to email me your thoughts (LKolivakis@gmail.com) on this subject. As always, please remember to donate and/or subscribe to this blog on the top right-hand side via PayPal. Thanks you!